C3V Wave 21, Pack 2! To finish up 2018, we continue Wave 21 with Heroes of the Moonlight Vale, a pack that contains 5 unique heroes from 5 different Valkyrie Generals. Arthur gallops in to join the Merry Men of Sherwood Forest. He is an adept rider, but that's not his most impressive trick. A true nimble-fingered rogue, he can pick up treasure without stopping. And beware as he rides by: he's the one that gets to deal a passing blow. The figure used for this unit is a Dungeons and Dragons figure from the Savage Encounters set. The name of the figure used is Human Outrider. Note: Arthur of Sherwood is a double-spaced figure. Owlbears are one of Toril's most feared creatures, and Kozil is no exception. He's brutal when attacking, and unpredictable when wounded. Aquilla summons him to fight alongside her swarm of spiders. The figure used for this unit is the Owlbear from the Blood of Gruumsh box set from the D&D Dungeon Command line. Boreos is a blustery force for Jandar. He's a positioning nightmare on the battlefield, stopping opponents in their tracks and attacking them before they can get adjacent. Beware as he flies overhead, too. His gale-force winds pick up allies and enemies alike. The figure used for this unit is a D&D figure from the Elemental Evil set. Its model name is #029 Air Elemental. An unpainted version of this miniature is also available in the Dungeons & Dragons: Temple of Elemental Evil board game. Valkrill has created an abomination. A kyrie, once free and proud, was tortured under the wellspring magic harnessed by Valkrill. Out came a force so vile that Death itself can never hold it for long. In Azazel, the Death Knights have a true master, a relentless warrior who has faced Death and come out unbowed. The figure used for this unit is a Tarry Fiend from the Pathfinder Battles, Wrath of the Righteous set. Constructs are mindless by nature, and easily controllable. Kurrok does as much to his Elemental minions, and now Utgar has summoned a sorcerer to harness the power of the great constructs. Elementals and Golems alike now serve the every whim of this great magician. 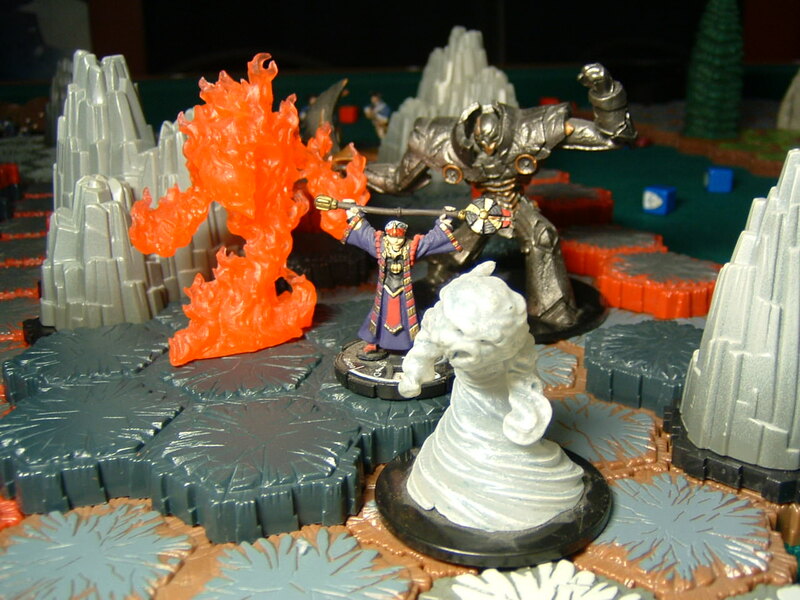 The figure used for this unit is from the Mage Knight Dungeons Heroic Quests: The Citadel set. The name of the figure used is Captain Salidar. NOTE: Both of the spoilers are double-spaced figures. Our next few packs are lining up quite nicely, with pirates, giants, constructs, undead, and at least one big surprise. Check out our Public Playtesting forum for some upcoming units, and run some tests if you can. Every test gets us closer to new releases. We couldn't do it without you. To amp up your Valhalla Customs fun this winter, be on the lookout for two SoV approved designs to be finalized within the next week or so. Tetraites by Sir Heroscape and Bol by The Dewk have gotten their final touches from Editing and Art, and are just going through one last Inner Sanctum vote. From all of us in the C3V to the 'Scapers community, we wish you a Merry Christmas and a Happy 'Scaping Holiday! Hey all--proper uploads to cards and PDFs in the gallery/downloads section will be happening early tomorrow morning. Sorry for the delay! Arthur is quite nifty. Even if there's no Treasure Glyphs in the game, he still seems quite good. I'll have to proxy him into one of my games sometime. Kozil looks powerful. The Spiders are going to love him. Boreos' combination of 2 Range, Stealth Flying, and Swirling Vortex seems like it'll give certain units (small/medium melee) fits. Add in Vortex Pull and he'll make the battlefield look very different from any other matchup. It is always exciting to see new units "hit the shelves" and these do not disappoint. Great work, guys! I had the chance to playtest Azazel with @chas . It's nice to see him finally released. What an array of units. These guys will definitely give out some new interesting options at the tournaments in Utah and Idaho. So much synergy I love it! It's great to see both some old faces from the Public Playtesting Forum and some new ones officially released! I particularly like how simple Arthur is, yet he brings a lot to the Nottinghams. I'm a bit surprised that Talingul doesn't follow Einar, given his very purple robes, though I guess he is following in Kurrok's footsteps. It'll be great to get some more playtime with my Iron Golems and Ice Elementals nonetheless! Wow! These are fantastic!! This might be my favorite pack you guys have put out so far and that says a lot. Looking forward to pulling these figures out of waiting and get them to the battlefield. Thanks C3V - great work as always! Yeah, we announce minis long before release. Sometimes a mini will be hard to find for people who didn’t get them at the time. I'd just lurk around eBay. Somebody's bound to put up the Mage Knight Citadel pack sooner or later, and then you'll get 5 C3V heroes! A very nice pack for Christmas ! I'm happy to have bought these five heroes.